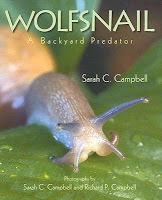 “Do we have these around us?” asked the resident seven-year-old after reading Wolfsnail by Sarah C. Campbell. I’m not sure why he wanted them around our house, but I can imagine him, or any dirty-kneed summer time boy, crouching behind the house studying the wolfsnail as it makes its way across the hostas, hoping like crazy it catches something while he’s watching. That’s pretty much the way it goes with the book as well. Readers will pay close attention to the text, learning about wonderfully gross things like mucus and slime and tentacles. The photographs are excellent and larger than life. Young boys might think they can climb up and ride these carnivorous monsters, when in reality adults are only 1.5 - 3 inches long. The end of the hunt is especially cool. The wolfsnail stretches to reach the next leaf, finds its prey, attacks (as a snail would…there’s no pouncing here), and dines. Finally, there’s a close-up of the now empty shell. 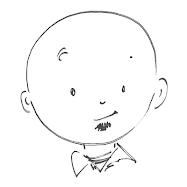 Wolfsnail was named a Geisel Honor book in 2009. While very different from this year’s Medal winner, Are You Ready to Play Outside? by Mo Willems, it is equally as deserving and engaging to young readers, but in a completely different way.